Hoarding is a form of an Obsessive Compulsive Disorder, also known as OCD. The intentions of the person collecting multiple items to save and store for themselves or loved ones always begins thoughtful but the overabundance can eventually turn the property into a dangerous environment for them and anyone else occupying the space. KRI offers discreet and respectful hoarding cleanup services for Texas, Arkansas, Oklahoma and Louisiana. If you’ve noticed getting around your home is becoming harder and harder due to stacks of paper, trash, news articles, food, animals or any other type of collection, it could be putting you in danger and KRI can help you get a fresh start. If the time comes and you wish to seek a balance between what is of financial or sentimental value and what is not – our specialized hoarding professionals can help you. We respect you, your belonging and your property while at the same time assisting you with sorting through all the memories, as well as the clutter that you agree is not necessary for your happiness. When you choose our trained hoarding cleanup professionals the process doesn’t involve just throwing out your belongings, we will help you reclaim your home and restore it to a safe and enjoyable space you will be happy with. We can sanitize, help you organize and even donate things you choose to places in need. Together, when our cleanup services are through you will feel relief and happiness about the fresh start that you and your home has been given. 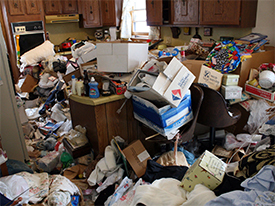 Our specialized hoarding cleanup crew will handle your possessions with care and will be discreet about our cleanup. Our first and foremost concern is for your health and safety, as well as the safety of anyone else residing of frequently visiting. Our hoarding and clutter cleanup service can lift some of that heavy weight off your shoulders, if you don’t know where to start – pick up the phone and call KRI, we can do this together! Call KRI for a confidential consultation on our hoarding and clutter cleanup services today at 1-888-382-2930, email at [email protected] or fill out our service inquiry form on our contact page.